Desh 2 June 2016 pdf ebook file. Desh is West Bengal literary fortnightly magazine issue from Anandabazar patrika and published from Kolkata, West Bengal, India. Since on November 24, 1933 and published by the Ananda Bazar Patrika Group and issue on the 2nd and 17th date of every month. At present time Harsha Dutta is editor of the magazine. Now this magazine's topic about literature politics, play, nowadays, cinema, theater etc, all of the current issues being printed. 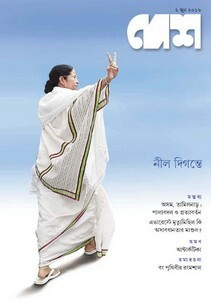 This edition inner topics are Blue horizon- true story about Mamata Banerjee, Comments about expedition on the Everest, stories by various authors etc. Collect also old edition of Desh patrika.